KENT, November 13, 2018 — The Spokane Chiefs defeated the Seattle Thunderbirds 3-2 in overtime Tuesday night at accesso ShoWare Center. 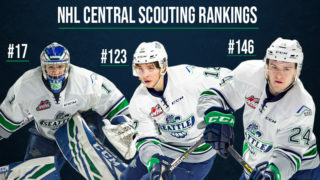 The T-Birds travel to Spokane to play the Chiefs on Friday at 7:05pm. They are back home at accesso ShoWare Center on Saturday at 6:05pm to play the Portland Winterhawks in a game that will be broadcast on JOEtv. Seattle (7-8-3-0) took a 1-0 lead at 3:36 of the first period on Payton Mount’s first career goal. Matthew Wedman won a faceoff in the right circle of the Spokane zone forward. Mount skated in and got the puck, put it through a defenseman’s legs and then came in alone on Spokane goalie Dawson Weatherill. Mount went forehand backhand and roofed the puck over the goalie’s blocker. The T-Birds outshot the Chiefs 11-10 in the first period. Jaxan Kaluski skating down the left wing on a two-on-one break with Zack Andrusiak. Jaxan Kaluski and Zack Andrusiak combined on a pretty two-on-one break at 5:29 of the second period to put the T-Birds up 2-0. Kaluski came down the left wing with Andrusiak on his right. Kaluski skated into the left circle, slowed up and then crossed the puck to Andrusiak in the slot. Andrusiak snapped the pass past a lunging Weatherill for his eighth goal of the season. Dillon Hamaliuk was awarded a penalty shot at 16:38 of the second when he was taken down from behind on a breakaway. Hamaliuk skated wide right and then entered the Spokane zone. Hamaliuk stickhandled toward Weatherill and took a shot just missing the net wide left. Spokane (10-7-1-2) outshot Seattle 12-9 in the second period and led 22-20 in shots after two periods. The Chiefs cut the T-Birds lead to one with a power-play goal by Ethan McIndoe at 7:05 of the third period. Ty Smith and Carter Chorney had the assists. Smith tied the game 2-2 at 16:50 of the second. Chorney and Luke Toporowski had the assists. 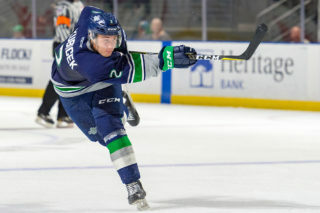 Toporowski scored the overtime game-winning goal at 3:58 when his shot hit a stick and deflected up and over Seattle goalie Liam Hughes into the back the back of the net. The T-Birds outshot the Chiefs 39-37 in the game. Hughes had 34 saves and his record is now 7-6-2-0. Weatherill made 37 saves and his record is now 3-4-0-1. First period – 1, Seattle, Mount 1 (Wedman), 3:36. Penalties – Woods, Spo (holding), 16:13. Huo, Sea (holding opponents stick), 18:15. Lee, Sea (interference), 18:47. Woods, Spo (unsportsmanlike conduct), 20:00. Second period – 2, Seattle, Andrusiak 8 (Kaluski), 3:05. Penalties – Huo, Sea (high-sticking), 5:29. Savey, Sea (charging), 11:39. Overtime – 5, Spokane, Toporowski 7 (Zummack, Smith), 3:58. Penalties – No penalties. Shots on goal – Seattle 11-9-17-2 39, Spokane 10-12-14-1 37. 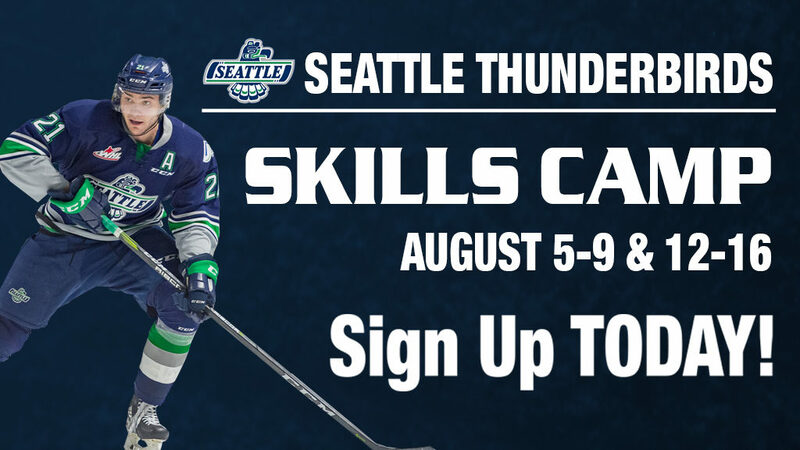 Goalies – Seattle, Hughes 37 shots-34 saves (7-6-2-0); Spokane, Weatherill 39-37 (3-4-0-1). 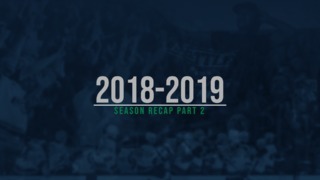 Power plays – Seattle 0-3; Spokane 1-6. A – 4,253. Referees – Bryan Bourdon, Ryan O’Keeffe. Linesmen – Nick Bilko, Cameron Wetmore.